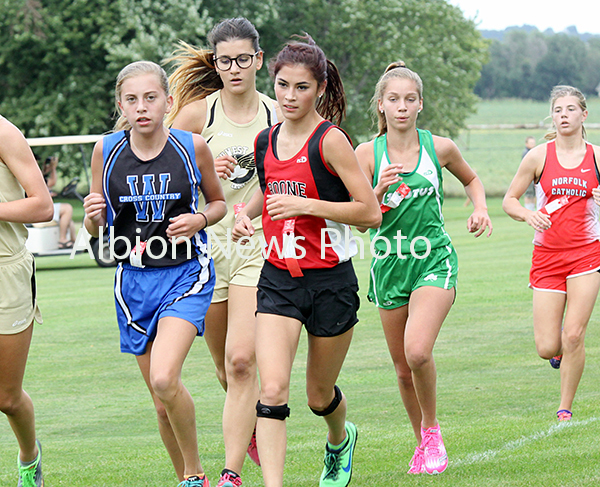 Senior Christina Stopak began her senior cross country season in splendid fashion and a number of Boone Central/Newman Grove runners made their high school varsity debuts in the Boone Central Invitational Friday at the Albion Country Club. Stopak placed third in the girls’ competition with a personal record time (20:00), one of four Cardinal runners to set new personal-best marks. Her strong effort – #2 all-time on BC charts and the #2 senior time – led the BC/NG girls to a fifth-place finish, while the young boys’ squad placed ninth in the team standings. 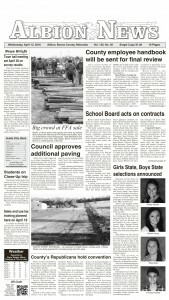 “It was a typical Boone Central Invite, mostly just getting our feet wet,” commented Card Coach Tom Dickey. “I thought the kids did a great job of controlling their races and competing. We had several large personal bests – all from hard work over the summer and adding a track season to their training. “It was great to see Christina near the front of the pack and finishing with a time that’s her best and close to our all-time best. I was also excited to see the results of the new kids in the program – now they have something to base their goals on.